’Sass the Patriarchy’ is about positive action, the creation of opportunity for women and non-binary people, and a chance to show support. This Way North started these events in Melbourne, Australia and have since taken it to Perth, Western Australia, Auckland, New Zealand and will do two very special shows in Canada. One in Vancouver and one in Edmonton during their Canadian summer tour. The night will involve several local Vancouver acts as well as This Way North and art exhibitions by local artists. During the night there will be discussions with the artists and audience about the past, present and bright future of women/ non-binary people in the music industry. The event will feature special guests to host the night. 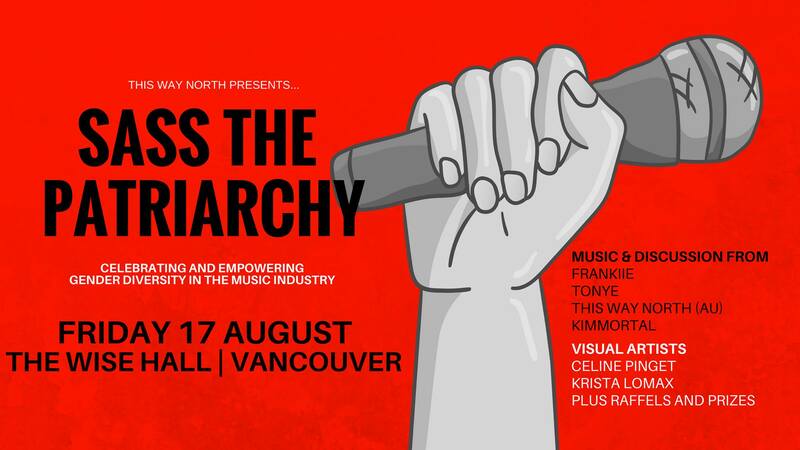 The short discussions will center around the artist’s experiences in the industry, and importantly the strategies and resources available that might improve the music environment for women/ non-binary both now and in the future. We’ll cover issues such as equal representation on festival lineups (and all line-ups), how to include more women/ non-binary into industry roles such as sound engineers, producers, radio hosts and managers, and continuing the efforts to make places of work and play, safe and inclusive. Positive, Informative, and fun, this night belongs to everyone who wants to see a positive change. Participate, have your say, bring your ideas or just listen, this will be a safe and inclusive space to do so. There’ll be great live music, short but thought-provoking discussions, cheap beer, and a raffle to raise funds for a local women’s/non-binary Vancouver charity.